Vinyl LP, Tape & Minidisc to PC transfer kit. Copy all your old Vinyl LPs, Cassettes & Minidiscs to a Windows PC using our transfer kit - one end plugs into the headphone socket on your player, the other to the 3.5mm Line-In or Mic socket on your PC. or upload the MP3 tracks to your iTunes library and iPhone/iPad. Kit contains all the leads, software, video tutorials and printed instructions required. 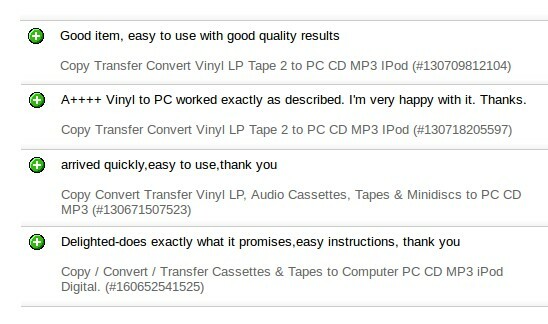 • Transfer vinyl LPs and singles to your PC. • Get all your old cassette tapes onto your PC. • Convert all your Minidiscs to MP3. • Burn your recordings onto regular audio CDs. • Save captured audio files as MP3 files. • Get all your old LPs & tapes onto your Apple iPad and iTunes. • Transfer audio books & language tapes to a PC. • Transfer from dictaphone microcassette & voice recorders to PC. • Copy mix tapes from C60 and C90 cassettes to digital. • Digitise & enhance old cassette tapes you have of family members. • Record direct from mixing deck headphone output to PC. • Remove scratches, tape motor noise, annoying pops & clicks. 1x 3.5mm stereo plug to plug lead. 1x 1/4 inch headphone jack plug to 3.5mm stereo socket adapter. 1x 2 phono RCA plugs to 3.5mm stereo socket. Audacity audio capture software. Windows 10, 8.1, 8, 7, Vista & XP compatible. Export as WAV or MP3. 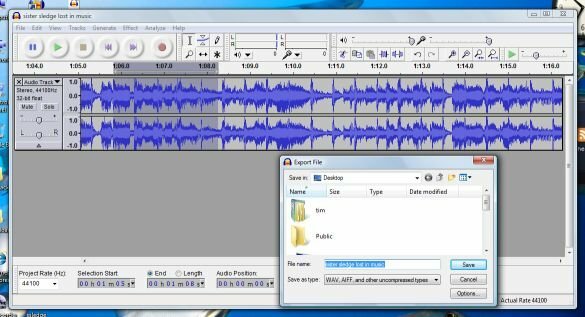 InfraRecorder lets you burn the captured WAV files to create regular audio CDs. Tested with XP, Vista & Windows 10, 8.1, 8 & 7. Compatible with all CD & DVD writers. All software is open-source, so any new versions that get released are free to download. Don't waste money on separate USB turntables and USB tape players. This kit gives great results using your existing stereo (regular headphone socket required). Just check our eBay Feedback below. Attach the lead we supply to the 3.5mm Line-In socket on a desktop/tower PC or the Mic-In socket on a laptop. Either will give great results. The other end of the lead plugs into the headphone output socket on your Vinyl, Tape or MD player. We supply an adapter for the older/larger style 6.35mm (1/4 inch) headphone output. Kit contents: 1x 3.5mm plug to plug lead 2 metres in length, 1x 1/4 inch to 3.5mm headphone adapter, A 2x phono plug to 3.5mm socket adapter, printed instructions, CD (shown in photo above). Q. Can the kit really capture audio from tape, minidisc & vinyl? A. Our kit will capture audio from ANY player with a standard headphone output (6.35mm or 3.5mm). Q. How long does the capture process take? A. Recording 30 minutes of music to PC takes 30 minutes. Separating tracks 10 minutes. Burning to CD 10 minutes. The video tutorial on our CD guides you through each step. A. Yes, quite easily. Watch this four minute YouTube Demo. Q. Does the kit work with all versions of Windows? A. Yes. We've personally tested it with all variations of Windows 10, 8.1, 8, 7, Vista & XP. Q. Will the kit work with the modern Bush turntable I got for Christmas? A. Yes. They have a standard 3.5mm headphone/amp output. A. No it won't. 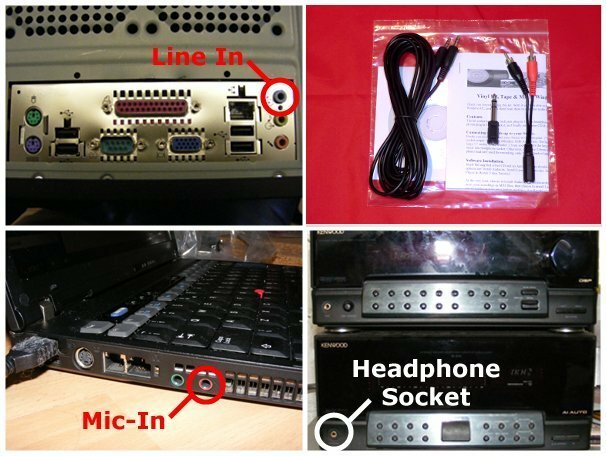 If your laptop doesn't have separate 3.5mm sockets for headphone & mic, then you're wasting your time buying this kit, sorry. Q. Where can I read product reviews of Vinyl-2-PC? You can read independent product reviews of Vinyl-2-PC at eBay. and Amazon. Q. Can I buy this product at my local PC Megastore? A. No, we only supply Vinyl-2-PC from this site, eBay and Amazon. We've tested the kit with desktop & laptop PCs running Windows 10, 8.1, 8, 7, Vista & XP. Thousands of satisfied customers are using this kit to convert their old vinyl, tape and minidisc collections. Got more questions? Call Tim at TR Computers on 01565 640739 or email tim@trcomputers.co.uk. We've been supplying computer equipment by mail order since 1989. We're based in Knutsford, Cheshire, UK. Price includes VAT, printed receipt included. Royal Mail UK Post & Packing from £2. We'll post the same day if ordered before 1pm Monday to Friday. Vinyl-2-PC is sent by 1st class post and will normally arrive the next working day. If for any reason you aren't completely delighted with our kit, return it for a full refund within 28 days of receipt. Order before 1pm Monday to Friday and we'll post your kit the same day. Looking for a Mac version of Vinyl-2-PC? Look at our Vinyl-2-Mac kit. Do you have VHS videos to convert? We also sell a Windows 10, 8.1, 7, Vista & XP compatible Video-2-PC kit for £34.95.